The Haggerty Award is given to the All-New York Metropolitan NCAA Division I men's college basketball player of the year, presented by the National Invitation Tournament (NIT) and the Met Basketball Writers Association (MBWA). First presented in 1936, it is arguably the oldest and most prestigious award given to a metropolitan area player. The award has gone to players from 15 Division I schools. St. John's University in Jamaica, New York has the most at 27, more than twice the nine awards received by players from number two Seton Hall University. Three players won the award three times: Jim McMillian from Columbia University (1968–1970), Chris Mullin of St. John's (1983–1985) and Charles Jenkins of Hofstra (2009–2011). McMillian would go on to win the 1972 NBA Championship with the Los Angeles Lakers; Mullin went on to win two Olympic gold medals (1984, 1992) with Team USA, was a five-time NBA All-Star and was elected to the Naismith Memorial Basketball Hall of Fame in 2011; and Jenkins has played in the NBA and Europe. St. John University's Chris Mullin is one of three players to win the award three times. Terry Dehere won in 1993 while playing as a Seton Hall Pirate. 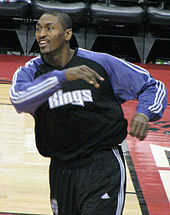 NBA champion Metta World Peace, known as Ron Artest in college, won the Haggerty Award in 1999. "List of Haggerty Award winners" (PDF). Men's basketball media guide. Hofstra University. 2009. Retrieved 20 April 2010. ^ Brennan, Sean (15 April 2009). "Day of Pride as Hofstra's Charles Jenkins wins Haggerty Award, Tom Pecora named Coach of the Year". New York Daily News. Retrieved 20 April 2010. This page was last edited on 15 January 2019, at 23:02 (UTC).